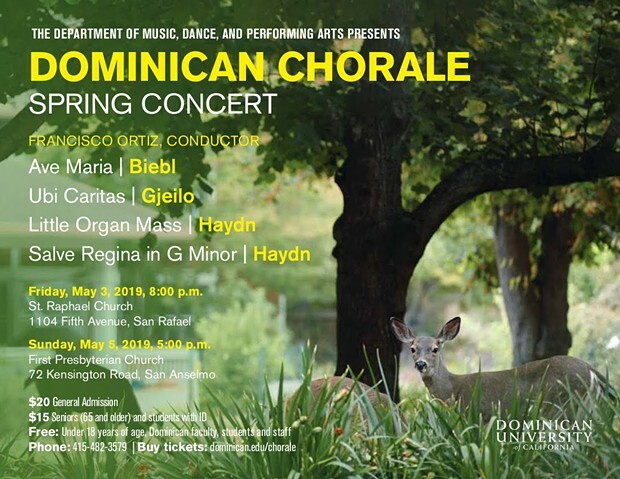 When: Fri., May 3, 8-9:15 p.m.
Price: $20 general admission; $15 seniors 65 and older and students with ID; free for those under 18 and Dominican students, faculty and staff. The Dominican Chorale, conducted by Francisco Ortiz, will perform Ave Maria by Franz Biebl, Ubi Caritas by Ola Gjeilo, and Little Organ Mass and Salve Regina in G Minor by Joseph Haydn. Tickets may be purchased at Dominican.edu/chorale or at the door.